We hold various one day tournaments throughout the year both for adults and for juniors. American Tournaments - doubles, no partner required. This is a relaxed and fun tournament for intermediate players. Play with different partners in each round and points go towards your individual score to produce one lady and one man winner. 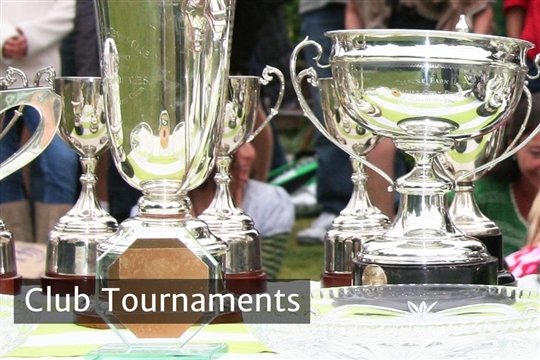 Adult and Child Tournaments - doubles, no partner required. Laver Cup - UK v the rest of the world tournament. All ages and abilities play for their countries! Club Championships - highlight of the Club’s year, the annual Club Championships are held in June and run over 2 weeks just before Wimbledon. There are 20 categories to enter, including men's, ladies' and juniors singles and doubles and vet's singles for men over 55. There is a huge entry and whilst some of the play can be serious, we encourage everyone to have a go – many surprise results have happened over the years! The Bar is open every night, manned by club members who put on 'special' evenings (Brendan's Brazilian night is always a favourite) and there is a tournament party mid-way through the event. Finals Day is a fantastic event - exciting matches and a huge tea, followed by speeches and prize giving.